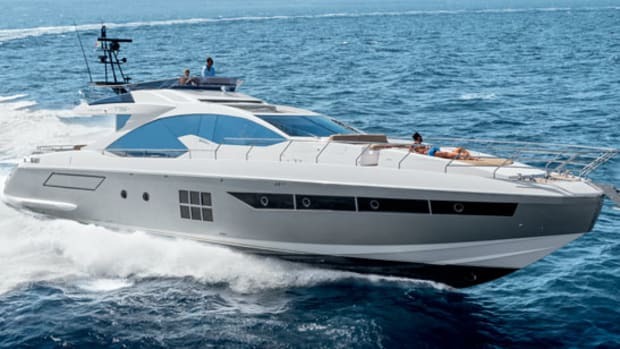 A short cruise along the Mediterranean coast gave European Editor Alan Harper a taste of all the Azimut Atlantis 50 has to offer—which it turns out is quite a lot. And she really is. 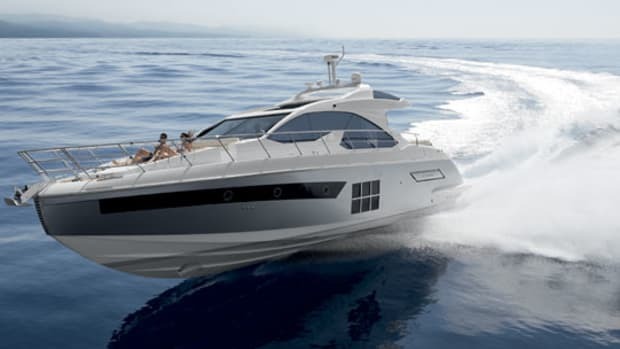 The Azimut Atlantis 50 is built at Azimut’s factory in Avigliana, the company’s home base, and receives, we are assured, exactly the same level of attention in terms of design, fit-out, and engineering as the parent marque. 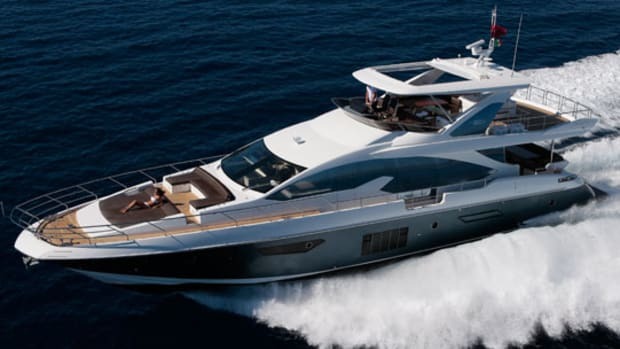 And that’s pretty clear when you step aboard—there are the big, chunky stainless steel handrails, several sizes larger than they really need to be; a signature of Azimut yachts. The saloon cabinetry is beautifully finished and not made of fiberglass, as you might expect, but of old-school, lacquered plywood. 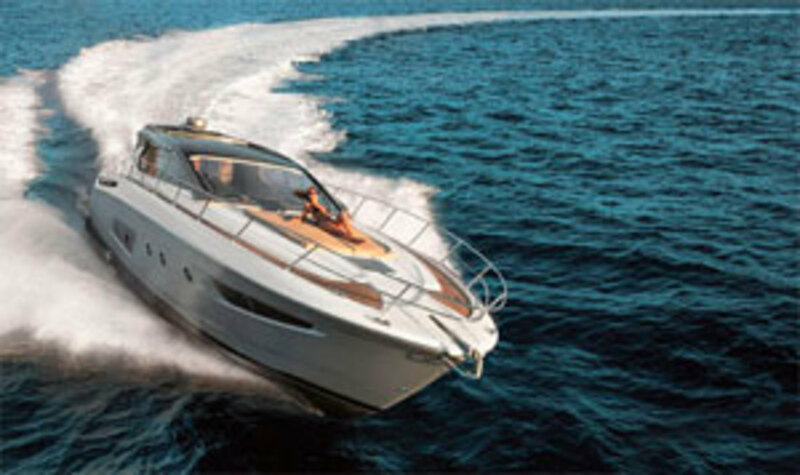 There is hidden quality, too, in the hull’s vinylester-resin outer skin and its vacuum-infused laminate. 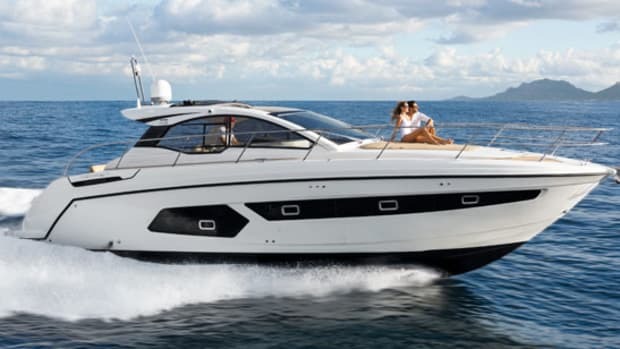 But, of course, the Azimut Atlantis 50 is not precisely an Azimut. She looks different and feels different, with her arrowhead exterior profile and simpler, but still cool and crisp, interior design. 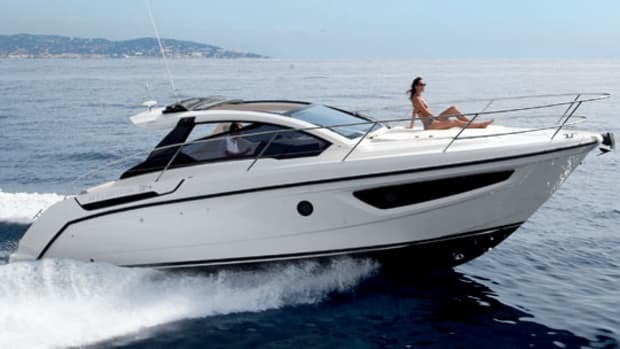 This is a boat conceived to compete on a different playing field, and like many recent midrange sport cruisers she comes with a choice of layout options on both decks. 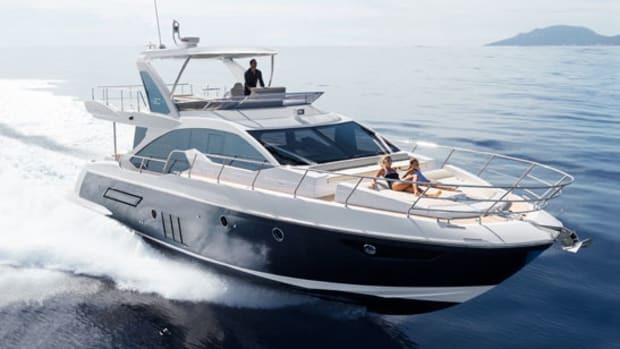 Most straightforwardly, you can have her with either two or three cabins: the lower dinette in the standard, two-stateroom version, on the starboard side opposite the galley, can be fitted out, if you prefer, as a small twin-bunk cabin. 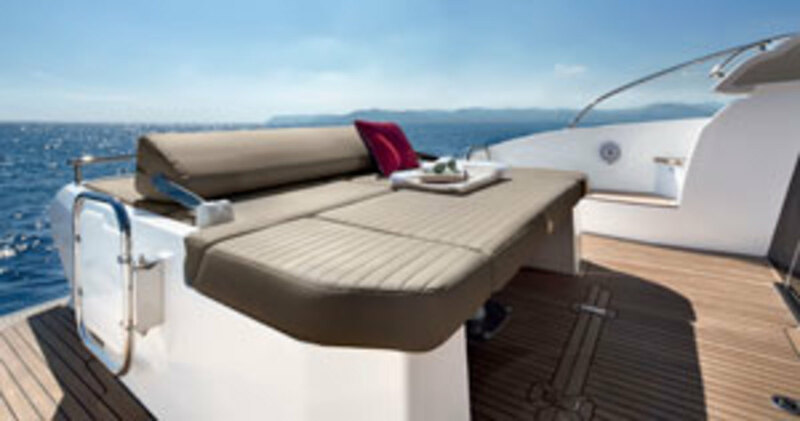 The stern seating area on the Azimut Atlantis 50 (shown above) is a minor masterpiece of design. The unit at the aft end of the cockpit combines a sunbed, sofa, and dinette in one clever package that unfolds and opens up like a 3-D puzzle. But it’s not a gimmick. The components are easy to operate and well thought out. The backrest, for example, is shaped like an isosceles triangle, which means it can sit at two angles and two heights. The short version: It works whether you want to sit up or lie down, and its simple frame flips backward or forward depending on which way you want to be facing. Then the forward seat cushion comes off to reveal a table, which raises up on its pedestal, and the side cushions slide out to the correct distance for dining. With two folding chairs—stowed in a locker under the aft cushion, so they’re always handy—the table seats six comfortably. And even with all that, this module doesn’t take up a lot of space: There is still plenty of room for two stern walkways, one each side, and a good-sized garage underneath. Bravo! Ours was the second 50 off the production line, a three-cabin Coupé, finished inside in an attractively stripy walnut veneer with cream-colored carpets and linings. The saloon offers a bright and comfortable environment, with big windows and an impressive sliding sunroof to augment the glass cockpit doors, which open up in three sections to create a doorway nearly 4 feet 6 inches wide. The side windows also have opening panels. The sideboard on the starboard side is designed to accommodate a fridge, ice maker, and pop-up TV, but on our test boat it was, well, just a sideboard. 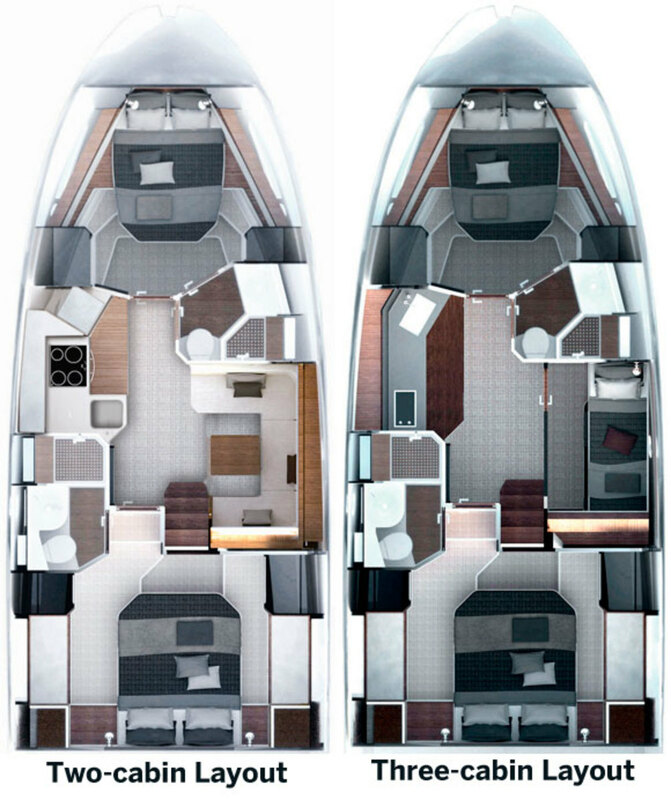 Down below, the master suite is amidships, under the cockpit, with limited headroom around the perimeter and several changes in floor level to accommodate the significant deadrise (15 degrees at the transom) of the hull. But the berth is full-size—6 feet 4 inches by 5 feet 4 inches—and the cabin also boasts an unusually impressive amount of stowage. Your VIP guests up in the bow should also be pretty happy, with a 6-foot 6-inch berth set at the proper level, and excellent headroom of around 6 feet 6 inches at the foot of the berth. Substantial hull windows both here and in the master let in plenty of daylight, and all cabins have opening portholes for fresh air. 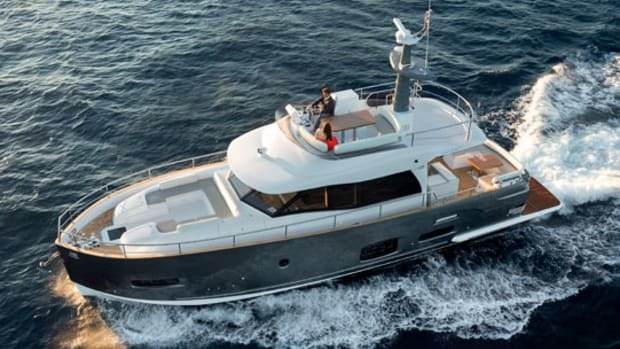 The private head in the master suite is on a roomy rectangular plan, while the dual-access compartment on the starboard side hardly feels smaller, and also has a separate shower compartment. That third cabin is small, but comfortable and practical enough for occasional use, or for kids, thanks to its straightforward layout and generous headroom. The berths are 6 feet 4 inches long, but pretty narrow at just 26 inches and 30 inches wide. 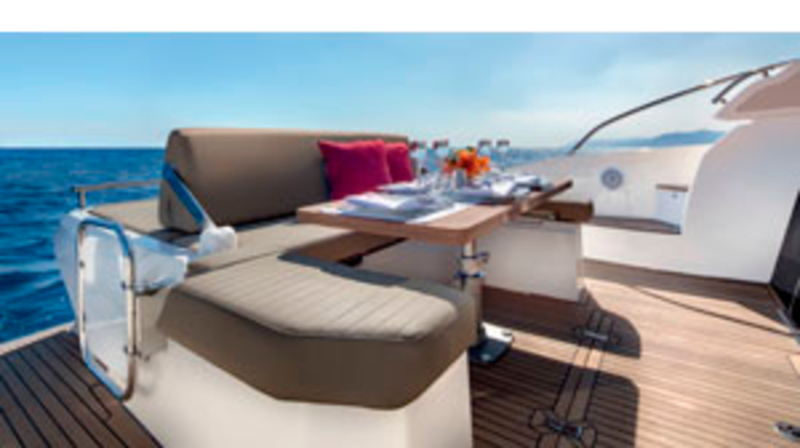 And if you were to opt for the dinette instead of the third cabin, the chef will thank you for it: The galley has all the expected levels of equipment, but pretty limited stowage and no useful worktop area. So the table in the dinette could come in pretty handy for food prep. One area of the boat where there are no choices is the engine room. The twin 600-horsepower, six-cylinder Cummins diesels drive conventional prop shafts through V-drive gearboxes. It’s a tight installation thanks to the encroachment of the tender garage, but the engineers have planned it well and access to filters, fuel-water separators, dipsticks, and header tanks is okay. It gets more challenging, though, if you need to service the generator, which is tucked away on the port side, while the batteries and air-conditioning units are buried right aft and are pretty hard to access as well. I like the IPS drives featured on so many of the 50’s European rivals, but I do enjoy a comfortable familiarity with traditional prop shafts. It’s an age thing. 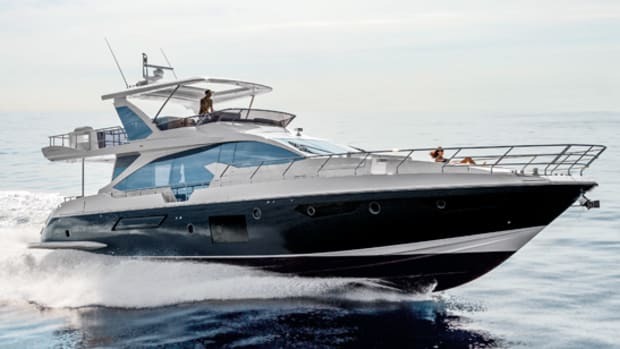 We tested the yacht at Azimut’s facility in Savona, not far west of Genoa, on a typically balmy day with light winds and 1- to 2-foot seas, which offered few challenges. 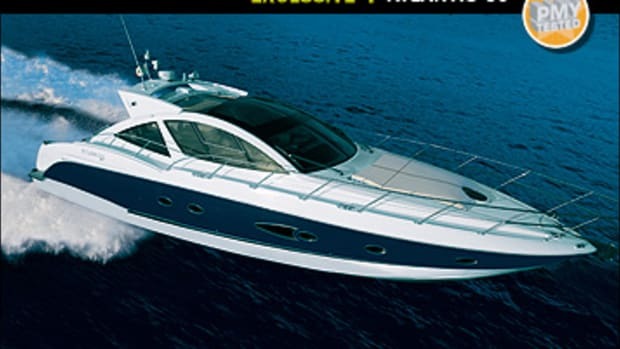 Acceleration was brisk, top speed was more than 32 knots, and the 50’s handling was taut and predictable. The turning circle felt pretty tight, with a comfortable angle of heel, while the shafts’ grip on the water induced a pleasurable sense of security. Winding on excessive helm soon became counterproductive, shedding speed without significantly increasing the rate of turn, and I soon learned to moderate my control inputs to get the best out of the boat. The engineers said they’d be adjusting the rudder stops to limit their angle to about 20 degrees, which should sort the problem. Once I’d figured it out, the boat gave us a fun ride. 210 gal. fuel, 26 gal. water, 6 persons, 250 lb. gear.